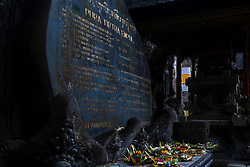 Tirta Empul, Holy Water Spring Temple, the most sacred watering place in the area, dating from 962 AD. 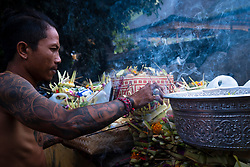 The temple is on the site of a spring, which constantly provides fresh holy water. 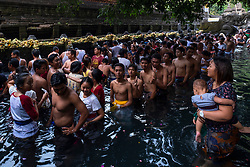 Tirta Empul means ‘holy spring’ in Balinese. It is the source of the River Pakerisan. The Hindu god Visnu is said to have created the pools. Humans were fighting a demon army and Vishnu struck a rock causing the waters to flow. The temple is dedicated to Vishnu. 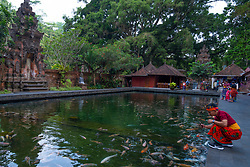 The place is normally full of local Balinese immersing and purifying themselves in the spring waters, which pour out of carved stone spouts. They move from spout to spout. Each one has Sanskrit words carved into its mouth, which give the meaning of that particular spout. The water passes over and touches these secret words before dousing the devotee’s head. The temple has three courtyards and the purification pools, full of their holy water, are in the central courtyard. Many people collect the holy water in bottles to take home. Sukarno built a presidential palace on the hill overlooking the temple in 1954.